A briefcase containing classified documents about sensitive sources was stolen from the Tampa hotel room of FBI special agent John P. O'Neill during the summer of 2001. It was recovered, and an investigation determined the contents had not been compromised. O'Neill was not punished, but he soon decided to take early retirement after 31 years in the Bureau, 25 as a special agent. He was the Bureau's resident expert on international terrorism. On 22 August 2001 he left the FBI to become director of security at the World Trade Center on 11 September 2001. O'Neill never finished his first day on the job. Nearly all the books about 9/11 mention O'Neill and note the irony of his leaving the Bureau when he did and the tragedy of his death. Murray Weiss has written a biography of the man that explains the severity of his loss and shows what inside- the-box thinking by management can do to creative, inspired, dedicated, passionate �if somewhat unorthodox�field agents. O'Neill played roles in most of the major terrorists incidents of the 1990s, including Oklahoma City, Khobar Towers, the embassy bombings in Nairobi and Tanzania, and the USS Cole suicide attack, all of which he viewed as tests of America's reaction and resolve. He was also involved in the capture in Qatar of Wali Khan Anim Shah (a participant in the 1993 World Trade Center bombing), and he headed the Washington end of the capture of Ramzi Yousef by Diplomatic Security Service agents in Pakistan. As he gained experience and a reputation for success, O'Neill also became the Bureau's guru on the perversely attractive Usama Bin Laden and al-Qa`ida�he believed what they said and was concerned others in government were indifferent. Bureaucratic and interagency conflicts are inescapable with such an aggressive and competent personality, and Weiss deals with many such incidents. One involved a laptop belonging to Wali Shah in Qatar that the CIA acquired after Shah's capture by FBI. CIA was reluctant to share the data on the laptop, but O'Neill persisted and eventually got his copy. Overall he was fair and respected by all the agencies involved in counterterrorism with the exception of the embassy in Yemen. The ambassador had maintained the Terrorism threat was minimal in Yemen. As Weiss tells the story, the Cole bombing and other incidents suggested her estimate lacked credibility. Still, she made life difficult for O'Neill and his team investigating the case. She chose to demonstrate that her power trumped the counterterrorism investigation and eventually banned O'Neill from the country. Her position did not alter O'Neill's judgment that Usama bin Laden was heading for an attack on American soil. The approach Weiss takes in his book does more than tell the story of John O'Neill's career. It also gives a look at the FBI and the way it functions, its traditions, its rigid rules that often result in self-inflicted wounds, and the reasons why it was something less than an efficient counterterrorist organ. Those concerned with how America fights counterterrorism�in or out of government�need to understand how the Bureau operates at the working level and how management affects its results. Murray Weiss offers a step toward this goal. Vera, Jill and Thomas Sung (left to right), who own and operate Abacus Federal Savings Bank. (Photo by Sean Lyness) (Sean Lyness). In the wake of the 2008 financial crisis, the biggest banks on Wall Street all avoided prosecution for fraud related to the sale of bad mortgages — as did their CEOs. Eleven percent of Americans over age 12 take antidepressants according to a report released Wednesday by the Centers for Disease Control. Vera, Jill and Thomas Sung (left to right), who own and operate Abacus Federal Savings Bank. (Photo by Sean Lyness) (Sean Lyness). Jihadist Groups in the US: What Next? Atlantic City Mayor Don Guardian speaks during the Saracini-O'Neill 9/11 Memorial service in Atlantic City, Sunday Sep. 11, 2016. 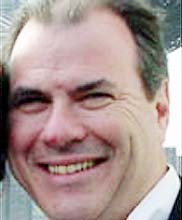 John P.
The lead investigation agent, John P. O'Neill, who would be killed in the Sept. 11, 2001 World Trade Center bombing, assigned O'Connor to find the dead sailors.